May 3: AYSO Sets the World Record for Biggest Pick-Up Game on Earth! We did it! 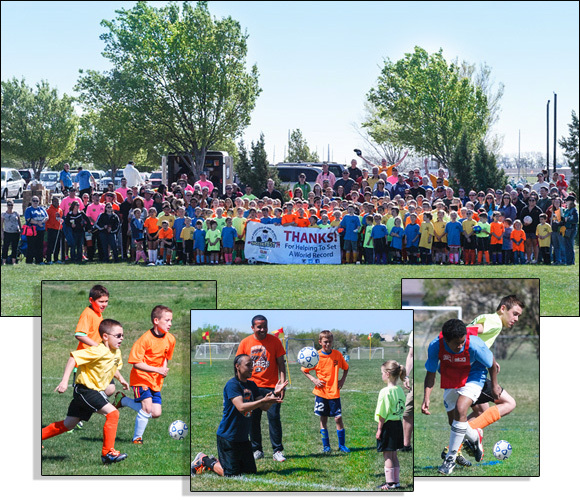 The first world record for the Biggest Pick-Up Game on Earth was set on Saturday, May 3, as 14,628 soccer players in 136 communities across the U.S. joined together to celebrate AYSO's landmark 50th Anniversary. Open to both AYSO and guest players, the pick-up style national event spotlighted soccer and fun as the foundation of a healthy, active lifestyle. Thousands of parents, siblings, volunteers and fans were on hand to cheer the players on to this first-ever world record. A special THANKS to DOLE® Fruit Squish'ems, the Official Snack of AYSO and Presenting Sponsor of #SoccerFEST14, and to FOX Sports 1, Presenting Sponsor of AYSO's 50th Anniversary.